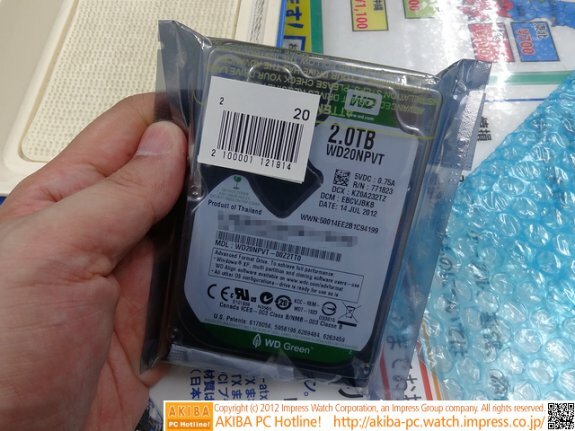 Western Digital's new WD Green WD20NPVT 2.5" HDD with a capacity of 2TB has hit Japanese retail stores. Unfortunately, the drive has a thickness of 15mm, significantly more than the standard 9.5mm thick drives used in most laptops. The drive provides a staggering 2 TB of unformatted capacity, and features IntelliPower variable spindle speed (4,500-5,400 RPM? ), 8 MB cache, SATA 3 Gb/s interface, 0.2W idle (parked) and 1.7W (active) power consumption. It is priced at 18,800 JPY (US $240).